Now you can take part in the latest fashion craze with Snap-On Feathers! It’s the fast, easy way to change your look instantly! These non-slip clips instantly snap onto your hair and quickly come off… Accent your hair for all occasions! 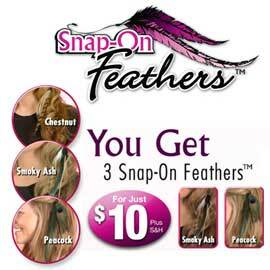 Snap-On Feathers™ are reusable and make a fun, affordable alternative to costly salons. For a limited time, you’ll get the popular Snap-On Feathers in Chestnut for the super low price of $10.00 plus $6.99 shipping and handling. Act now, and we’ll also include Smoky Ash and Peacock feathers in your set, just pay separate $6.99 processing. That’s a total of 3 Snap-On Feathers so you’ll have the perfect one for any look you want.